Glamorous, fun, energetic, and vibrant – Bollywood Hen Parties are perfect to enjoy a wonderful day with your girlfriends before your wedding day! In a typical Bollywood-themed Hen Party,the participants are provided Indian costumes and accessories so that all the girls dress up in Bollywood style and learn entertaining Bollywood dance moves from the films. 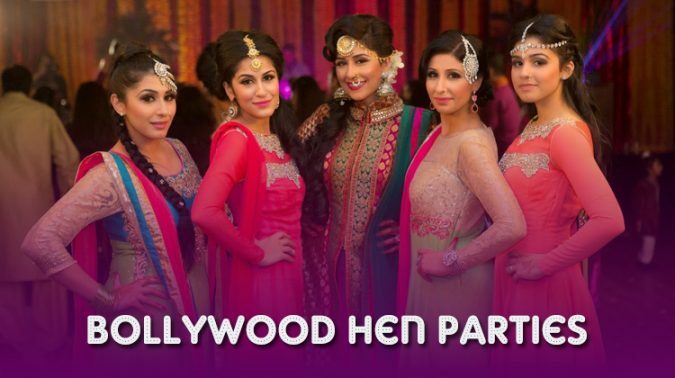 Bollywood Hen Party Workshop usually lasts for around 1.5 to 2 hours. In addition to the dance session,Bollywood Hen Party ideas also include a gift for the bride to take home at the end of the session. The Bollywood Hen Party in London especially is a grand affair as you can get a fantastic hen package in the heart of London for up to 15 people! Bollywood dance classes also include many options for the hens to choose from like modern Bollywood Movie-style dance classes and Bhangra Hen with traditional Bhangra moves. Hens also get to choose between male and female instructors, packages, costumes, and songs. As you plan to groove to a tailor-made dance lesson with your own Bollywood dance troupe, most Bollywood dance classes also give you the option of organizing the Hen Party at a venue of your choice if you are not comfortable with the studio. What’s more, the final dance routine can also be filmed and photographed so that the bride-to-be and the squad can capture all the special memories from the hen party! So, all the brides-to-be, don’t think any further! Book yourself a memorable Hen Party with Absolute Bollywood today!